Ramadan Mubarak! We began fasting this past Saturday which means a month of fasting and ibadah (worship). 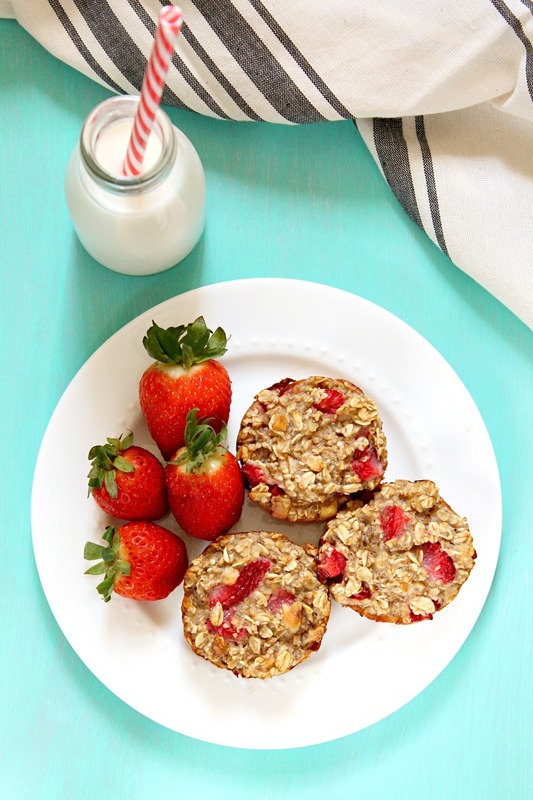 Today I'm sharing a recipe for Strawberry Banana Oatmeal Cups which would be great for suhoor (the pre dawn breakfast). For Suhoor, we don't like to have something very heavy. Usually we have cereal, eggs or oatmeal. I like to make suhoor ahead of time, so all I have to do is warm it up in the morning. These oatmeal cups can be made before and kept in the fridge. When you want to have them, all you have to do is warm them up in the microwave. I've adapted this recipe from my Baked Maple Walnut Banana Oatmeal Cups. This recipe is very versatile so you can experiment with different fruits and nuts. Pre-heat oven to 375 F. Spray muffin tin with baking spray. In a large bowl, add all ingredients and mix well. Divide evenly among muffin cups. Bake for 22 minutes. Let cool 10 minutes and enjoy! Leftovers should be stored in the fridge. Ramadan Mubarak to you and your family too!